WASHINGTON (Reuters) - Barbara Bush, the wife of former U.S. President George H.W. Bush, is in "failing health" and has decided to no longer seek medical treatment, the office of the ex-president said in a statement from Houston on Sunday. The former first lady, who is also the mother of former President George W. Bush, "will instead focus on comfort care," the statement said. She is 92 years old. 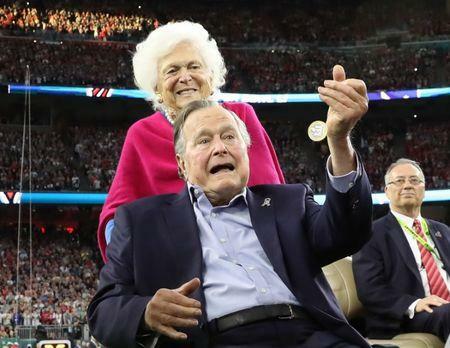 The brief statement did not indicate the nature of Bush's illness but said that she had had a series of recent hospitalizations. CNN reported that Bush was suffering from chronic obstructive pulmonary disease (COPD) and congestive heart failure. A Bush family spokesman said she was being cared for at her home. He did not provide information on the nature of her illness. "She is surrounded by a family she adores and appreciates the many kind messages and especially the prayers she is receiving," the statement added. As first lady from 1989 until the start of 1993, Bush was a popular national figure known for her sometimes blunt talk and self-deprecating wit. Her husband, the 41st U.S. president, is 93 years old. Her son, the 43 U.S. president, is 71. Another son, Jeb, is a former governor of Florida who ran unsuccessfully for president in 2015 and early 2016, quitting after a series of lackluster performances highlighted by tough skirmishes with then-candidate Donald Trump. White House spokeswoman Sarah Sanders said: "The president's and first lady's prayers are with all of the Bush family during this time." With hair that had turned white prematurely, Bush was known by family members as the "Silver Fox." Her work as first lady focused on promoting literacy and reading. At the time, she said she was more interested in running a household than in helping her husband run the country. "Barbara Bush has a character that is as big, inspiring and iconic as Texas," Texas Governor Greg Abbott said in a statement on Sunday. The Bushes moved to Texas in the mid-1940s. Bush holds a unique place in U.S. history. She is the only woman to see her husband and son sworn in as U.S. president. Abigail Adams, first lady from 1797 to 1801, was a major influence on husband John Adams, the nation's second president, but died before her son, John Quincy Adams, was elected president in 1824.